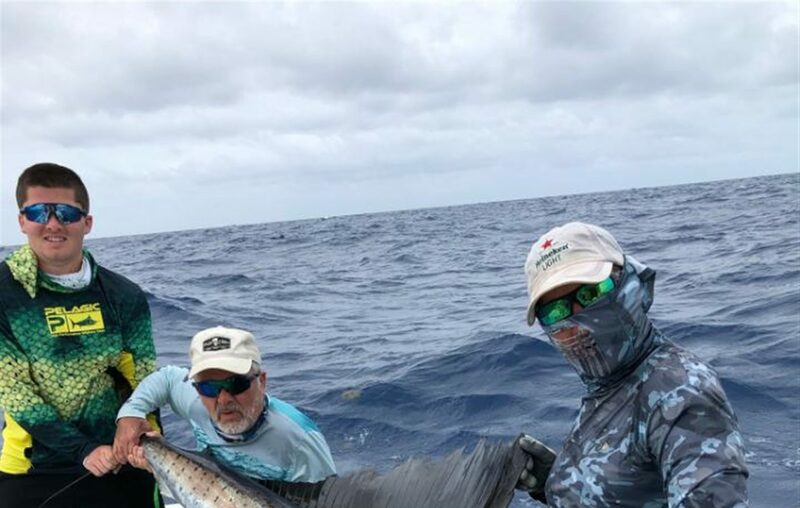 Ed Schintzius of Silver Creek (center) shows off his first sailfish he caught in the Florida Keys over the weekend. To the left is his grandson, Jarrod Wilt. To the right is Capt. Kenny Spaulding. My grandson, Jarod Wilt, and I and our two friends, Jim and Denise Tunney, went out fishing March 15 on a charter boat, the Caribsea from Caribsea Charters. We left on the 42-foot Guthrie from Islamorada in the Florida Keys at 8 a.m. on a cloudy day. The temperature was 75. It took us about a half-hour to get out to the Tennessee Reef. Capt. Kenny Spaulding and his son, Capt. Casey Spaulding, quickly caught our bait fish, ballyhoo, cigar minnows and sardines. We then went out to 105 feet of water, 5 miles off Islamorada in the Atlantic. The waves were between 5 and 6 feet high. We were fishing for sailfish using sardines as bait. We had six-foot Shimano rods and reels with 16-pound test line. We were kite fishing. The kites are up at least 100 feet in the air and away from the boat on the port and starboard sides. Kite fishing is challenging because as the waves come you have to make sure your bait stays in the water. Jarod caught the first sailfish, and it took him about 25 minutes to reel it in. My turn came next, almost immediately. I couldn't believe it when the sailfish was on. It was jumping out of the water and running away from the boat. I've been a fisherman my whole life and never experienced a fish this size. Every time he would get within 50 foot of the boat, he would turn around and run back into the ocean. This happened at least five times. He was a fighter, it took me about 45 minutes to land him. It was an exhilarating experience and something I'll never forget. It took three days for these old muscles to get back to feeling normal. Denise caught the third and last sailfish of the day. We also encountered several large sharks during the day and the captain and his son had lines pulled up to avoid them. We also pulled in a sand shark that was about five-feet long and a houndfish that was a little more than four feet. We gratefully pulled back into the dock about 4 p.m. We were exhausted. We talked to several other fishermen who did not have the same good luck we did. Many thanks to Captain Ken and Captain Casey Spaulding. You guys did a fantastic job for us.